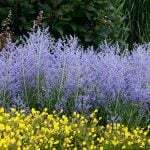 We’re big believers in the healing powers of the sun, the breeze, the outdoors. For some of us, a week laying at the pool at a resort in the tropics is not in the budget, right? So how about creating a resort like relaxation zone right in your own backyard? 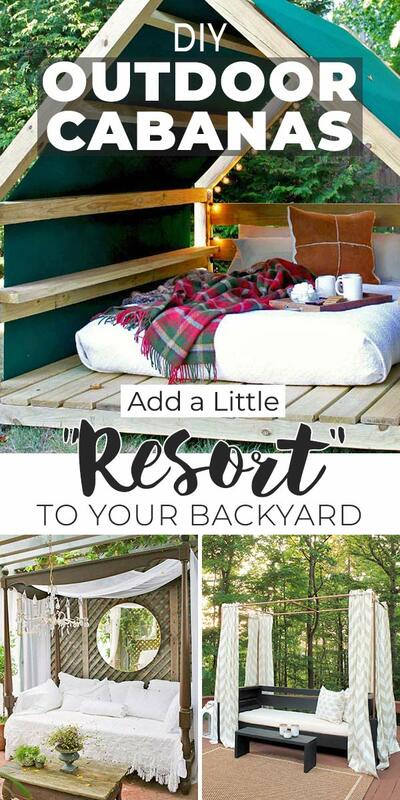 Build an outdoor cabana! 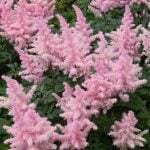 Use it to nap away a warm afternoon, have wine on a balmy evening, or star watch under quilts when the weather is cooler. An outdoor lounger is the perfect spot for some weekend self care. 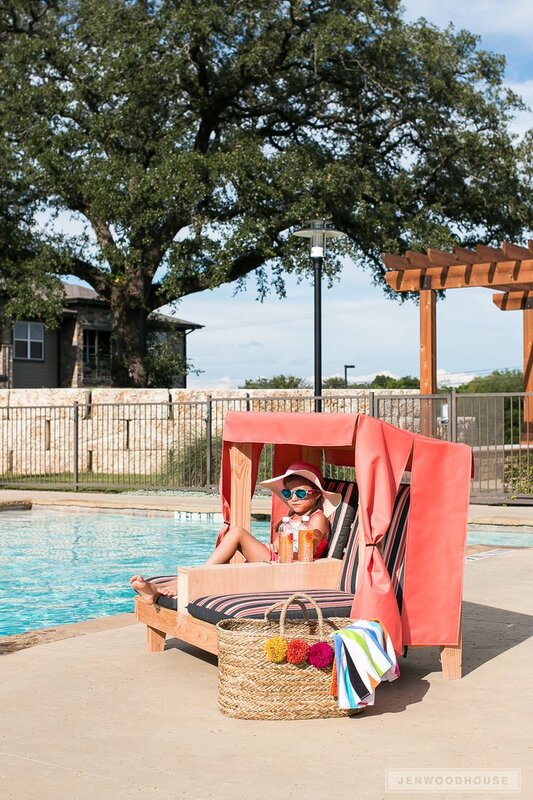 And you can make one of these DIY cabanas no matter what your skill level. 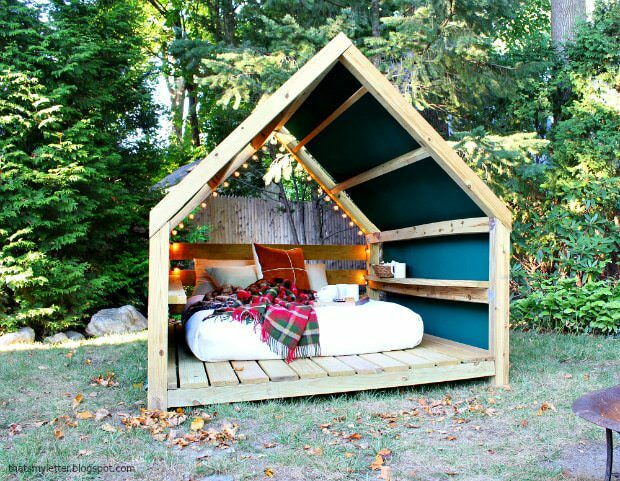 So let’s get to it, check out our favorite tutorials to build an awesome outdoor cabana! 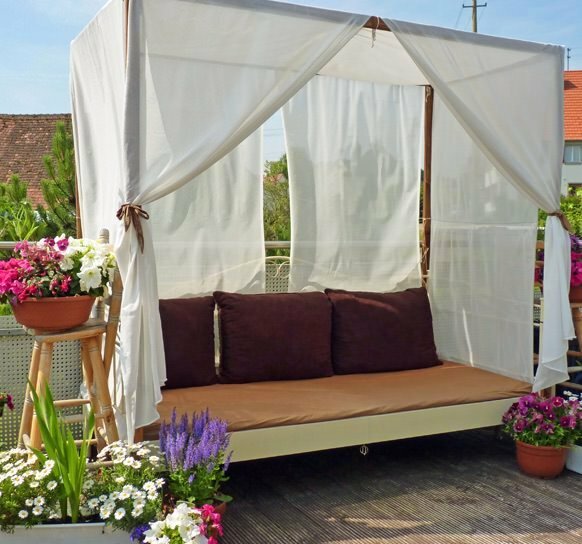 Let’s start out with this amazing outdoor cabana lounger built by ‘Jaime Castiglio‘. 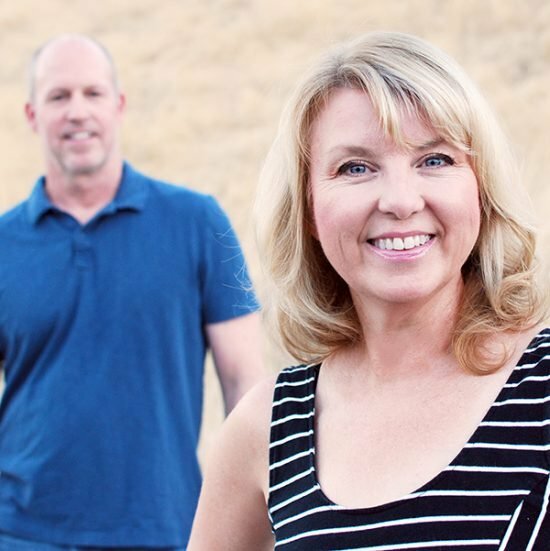 She used plans from one of our fav woodworkers, ‘Ana White’, but this project is all hers. The awning is easy and removable (for starry nights!) and the string lights are the perfect magical touch. I don’t know how she will ever get her kids to come inside at night! She has the link for Ana’s plans right there as well. Awesome! Oh my gosh. This is adorable, and I’m jealous of these kids all at the same time. 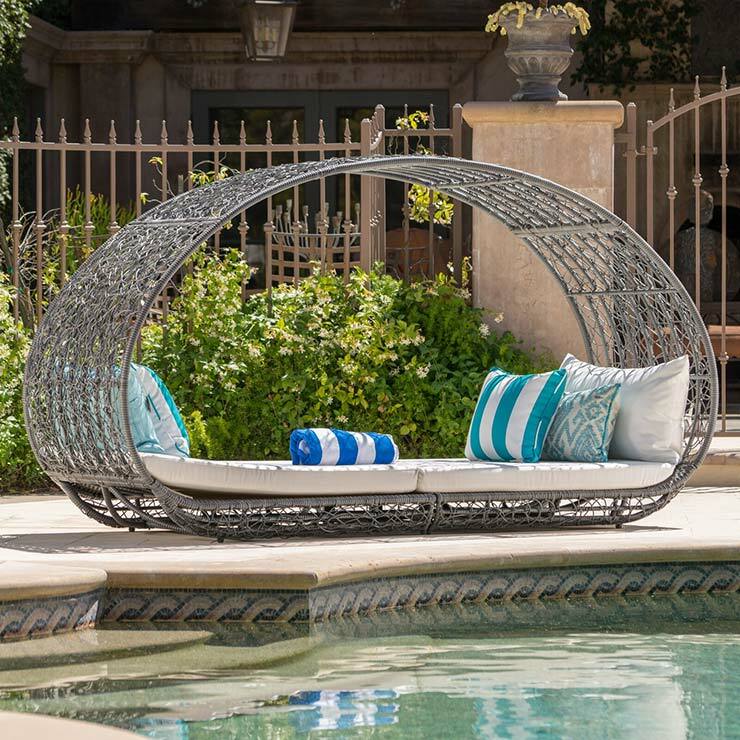 From ‘Jen Woodhouse‘, this double lounger with canopy is as perfect as it gets for kids! The little drink holders are perfection! She shares the link for her complete tutorial, including directions for how she sewed the canopy. I know we mentioned ‘Ana White‘ earlier, and here is another one of her designs. 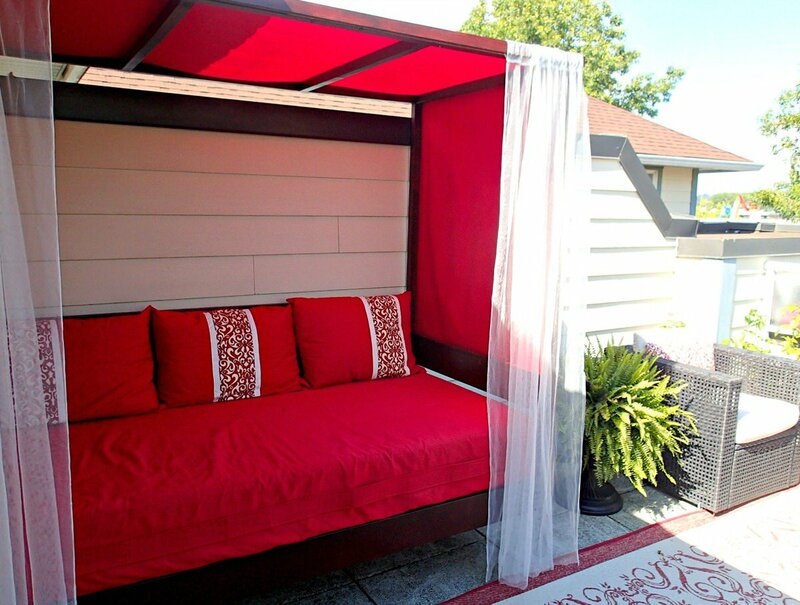 You can get the free plans to this outdoor daybed with a canopy at her site. 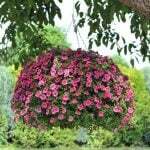 Easy to follow step by step drawings and instructions. She also has a brag section where her readers who have done this project have submitted their finished photos. You know, so you can see that real people can actually do this! 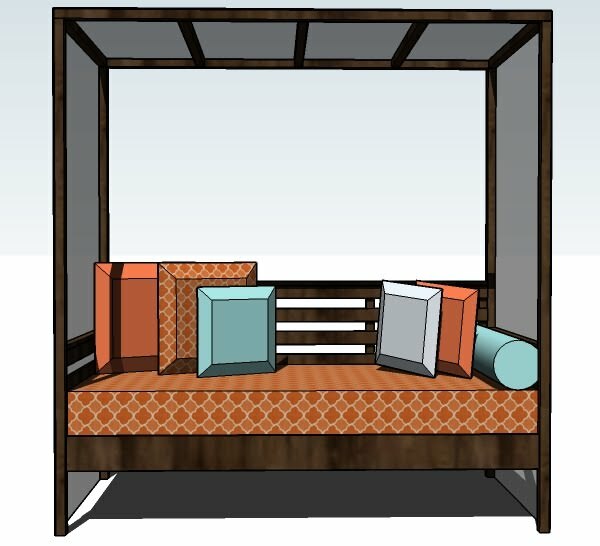 ‘Design by D9‘ actually used Ana’s plans we just featured to make this outdoor cabana daybed we love! 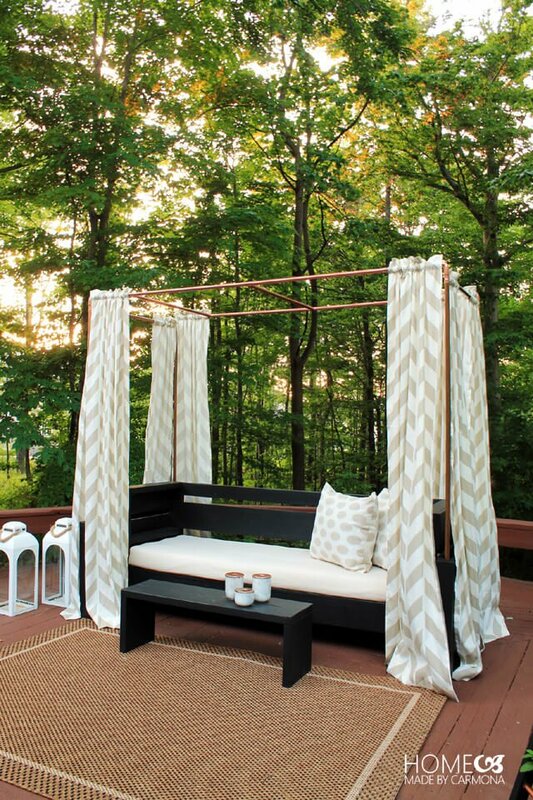 ‘Foxy Folksy‘ made this DIY outdoor canopy daybed from an old metal daybed, some timber, and some outdoor fabric. Such a calming place to spend an afternoon! This outdoor cabana from ‘Style Me Pretty‘ doesn’t have a tutorial, but by now, you’re an expert, right? 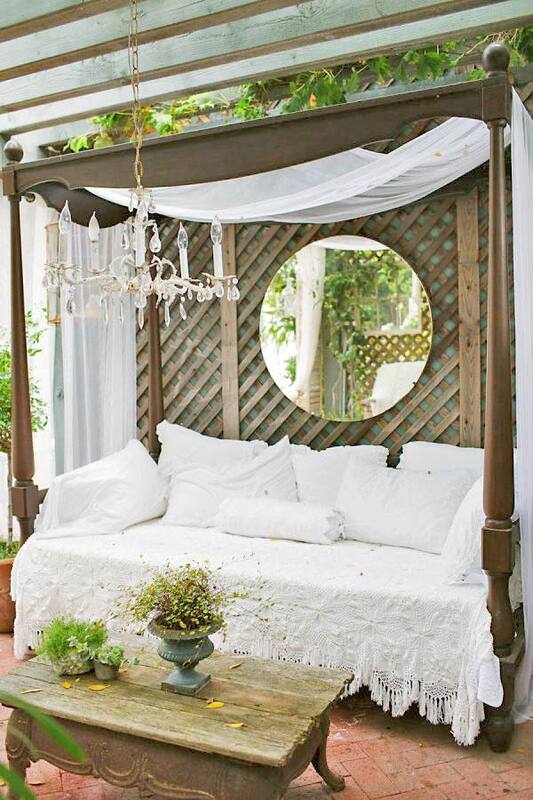 This charming vintage daybed is made from an old four poster bed with pretty fabric draped through. You could do the same thing by sealing an old four poster with exterior sealant, and using outdoor fabric to drape over as the canopy. (A fabric shower curtain or canvas drop cloth is a good budget choice!) Be sure not to do this with an expensive antique set though! But really, how dreamy is this? Ok, so maybe you don’t want to take the time to build your own outdoor cabana? 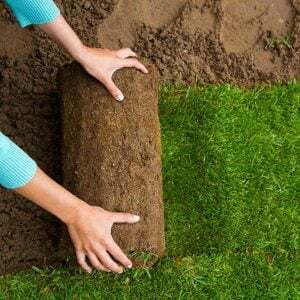 We found some great prices at ‘Wayfair‘ for outdoor daybeds that are reasonably priced, and all you have to do is set them up on the first warm day! 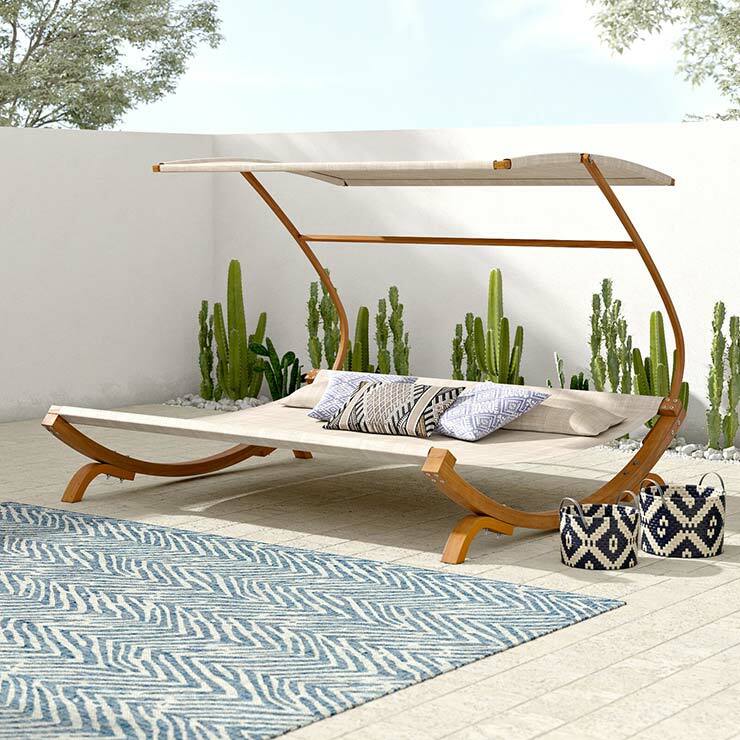 We like the “Lavina Outdoor Daybed“. It has so many great reviews, and free shipping! Got a book and glass of lemonade, anyone? Another affordable option from ‘Wayfair’ with great reviews is this “Tillis Teak Double Chaise Lounger” for you and your sweetie to get out of the sun and enjoy the outdoors. And, this one is less than $300. And it’s teak! Our last suggestion for you is the “Naperville Double Chaise Lounge” We love this one! The cushions are adjustable for each side, there are curtains for sun control or privacy, and it feels like you could make your own little world for a day. Ahhh! These outdoor cabanas and daybeds are the perfect way to turn your backyard into a resort like retreat. (But without the annoying guy doing cannonballs in the pool. We hope. 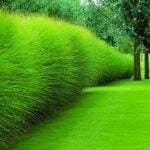 :) ) We think you will also love our posts on DIY Outdoor Bars , Make Your Backyard Awesome and 14 Super Cool Outdoor Furniture Projects!